In simple, LinkedIn is a social networking site for those individuals you are looking for more opportunities to take their professional life earnestly to enhance their carriers and connect with other professionals of similar interest and work category. LinkedIn also beneficial for the company looking for employers that best suits their working area. LinkedIn may look similar to popular social networking sites like Facebook and Twitter on its layout but working nature differs in many ways. While you use Facebook to connect with friends and family, you use LinkedIn to connect with professionals of similar career, increase business connection, share business ideas, look for jobs and search professional to hire. 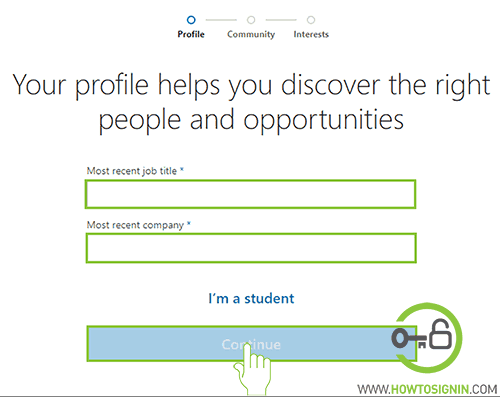 You can create professional and neatly organized CV like LinkedIn profile, laying out your Academic history, Employment history, professional skills, and other achievements so that you can show off your skill and qualification to other users so that they can connect you for jobs or any business discussion. 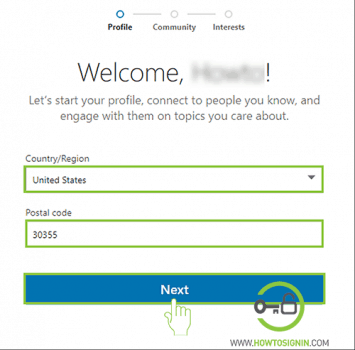 After you create a LinkedIn profile you can add other users to your network. 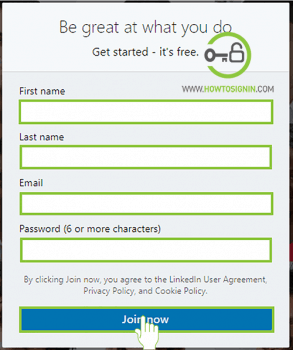 How to Create a LinkedIn account from web-browser? The basic version of LinkedIn is free to use similar to other popular social network sites. You must have a LinkedIn account to start using it. 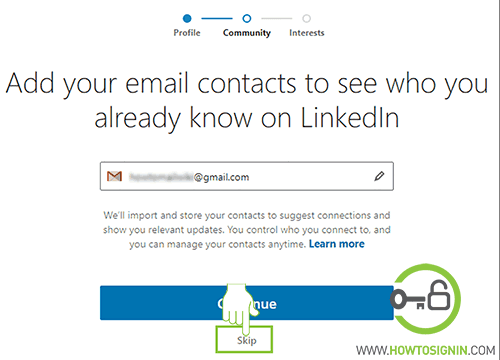 To create a new LinkedIn account, you just need your existing email address and password and few other basic information about yourself. On the signup box, enter your First and Last name. Enter your current or accessible email address. Enter your password. Make sure your password is hard for others but easy for you to remember. Choose your Country and Region and Postal code. Click ‘Next’. Enter code sent by LinkedIn to your email. Hit ‘Agree & Confirm’. You can choose to add contacts via your email address who are already present in LinkedIn. If you do not wish, you can skip. 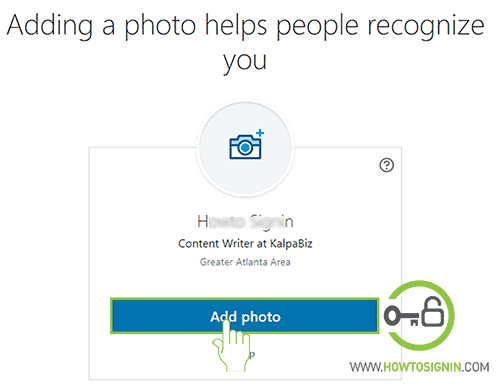 Add your photo so people can recognize you. Make sure you upload a decent photo as LinkedIn is a professional network and people want to see you professional in this network too. If you want to do it later, you can skip this too. You can also get the LinkedIn mobile app. To get the link via text or choose from Playstore or AppStore. You can also skip installing LinkedIn mobile app. Choose your field of interest. 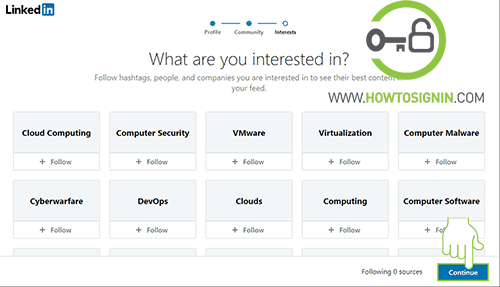 Think will help you to connect to the companies, professional and feeds related to your field of interest. Click ‘Continue’. Congratulation! your LinkedIn account is ready. You can also register for LinkedIn using LinkedIn mobile app available on both iOS and Android stores. Download and install the LinkedIn app from the respective store and install it. Open the LinkedIn app on your mobile. Tap on ‘JOIN NOW’ to open LinkedIn sign up form or you can also use your Google account to create LinkedIn, tap on JOIN WITH GOOGLE. 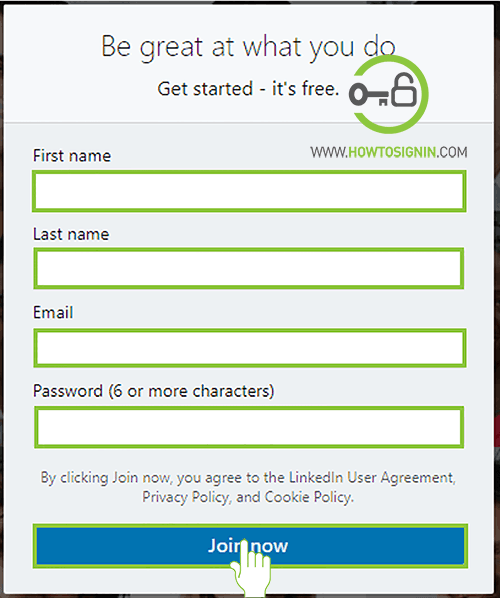 Enter fill up LinkedIn sign up form carefully. 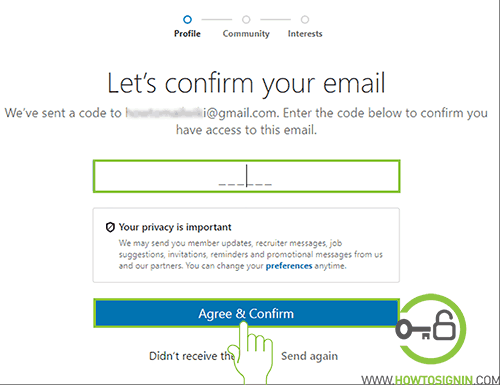 Your valid email address. This will also be your login id for LinkedIn. 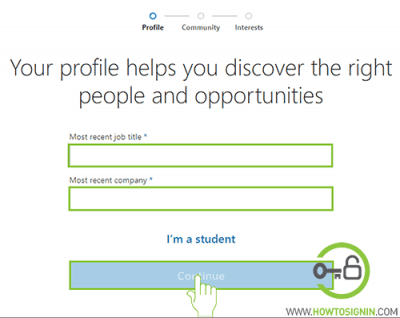 Choose a strong password for your LinkedIn account. Mix your password with alternate case letters, numbers and special characters to make it strong. Finally, tap AGREE & JOIN to complete LinkedIn registration from mobile.